Our skin is the largest organ in our body, covering almost 90% percent of it. As we get old, changes in our body are greatly manifested on our skin. Starting in the adolescence stage, people experience having breakouts. Acne pops out on our skin because of various reasons. What we probably don't know, or sometimes neglect is that the place where we usually or frequently get a break out means something about our health. Our pimple's location on our facial skin indicates that a part of our internal system has a problem. The practice is called "face mapping". Face mapping is a practice in which origin can be traced from early Chinese and Ayurvedic medicine. Due to the influence and the health benefits of the two mentioned alternative health practices, it was, later on, applied even in Western medicine. 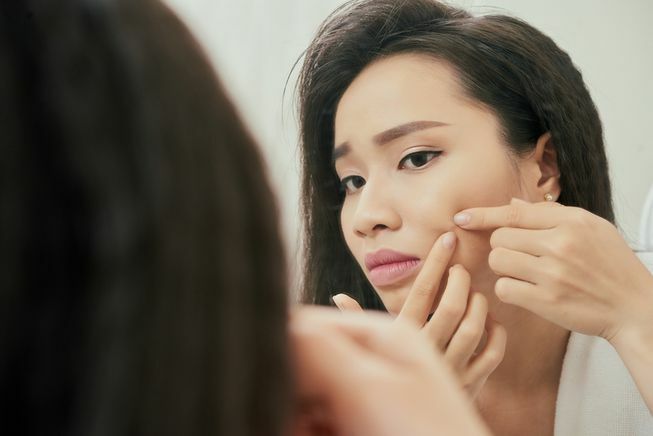 Although this practice is not that accurate for everyone, (since there could be other reasons for your stubborn acne) face mapping will still serve as a guide on to how we can possibly take care of our personal health. 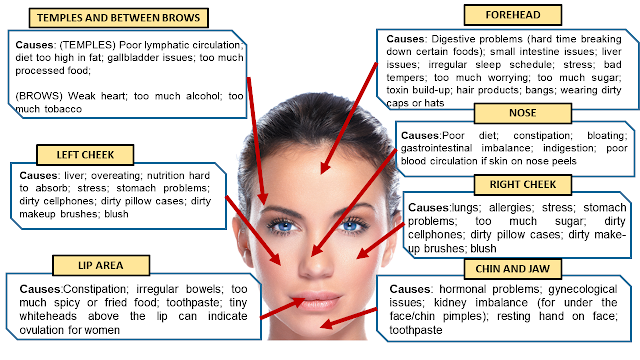 Here are the possible reasons for acne in each of the facial regions. Pimples on this region are usually caused by poor digestion and it says something about the condition of the liver. Lack of sleep can also trigger acne to pop out in this region. As a solution, you may increase your water intake and regularly drink green tea to flush away toxins in your body. In addition, have a regular sleeping pattern as much as possible. The acne around this region is linked to having liver problems. Care for your liver by avoiding alcoholic drinks as much as possible. Based on the practice of face mapping, the nose connected to the heart and high blood pressure. A well-balanced diet will promote heart health. Avoid eating foods high in salt and sugar content. A diet rich in vegetables and fruit is greatly beneficial. The skin problem in this area is closely linked to lung and stomach problems. Stress can also trigger pimples to break out in this region. You may also want to make sure that things that usually go in direct contact with your cheeks such as your cellphone and pillowcase are clean. Digestive problems just like constipation are the culprits for pimples in this facial region. Oral hygiene, on the other hand, is also deemed to contribute in the presence of pimples around the mouth. This area is linked to the small intestines. Once more, diet modification is a helpful key. One must develop a healthier eating habit to avoid having skin issues in this area. Generally, living a healthier life and maintaining proper hygiene are the main solutions to having frequent breakouts, There are plenty of natural ways to take care of our skin that you may try.